“Money is the root of all evil.” That is a quote I heard as a child, and it unconsciously affected me throughout most of my life. It wasn’t until I was well into adulthood that someone corrected me on the quote and pointed out that it had been misrepresented to me as a child. Apparently, “The love of money is the root of all evil” is the actual Biblical quote. For many years I had such an deeply-rooted negative association with the word “money” that I unconsciously sabotaged myself and blocked myself from my own greatest good. Consciously I didn’t buy into the irrational belief that money was evil. But the resistant feelings I inwardly had toward money prevented me from being in the abundant flow of what I now understand is one of the greatest tools for personal and global transformation. Now that I understand what love really is, I can see that the Biblical quote regarding money is one of the greatest misconceptions of all time. From another Bible verse, I recall the quote “Love is patient, love is kind. It does not envy, it does not boast, it is not proud. It does not dishonor others, it is not self-seeking.” If this is what love is, then how can it in any way be evil? How is it that love, when applied to money, becomes the root of all evil? It doesn’t! The misconception is that love is synonymous with greed. Greed is, in fact, the opposite of love. Greed is an emotion that is based in fear in the belief that there is lack. Love is generous and fear is greedy. The greed of money is the root of what many call evil. 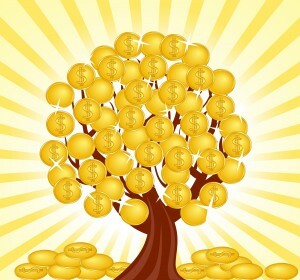 The genuine love of money is the root of all transformation. Gold is the color of unconditional love, and it is time to learn to love it for what it really is. If you look around the world and see all of the pain and suffering that is caused by the belief that some must lose in order to gain, it is fair to say that greed is the root of all evil. Greed causes men and women to act in ways that are the opposite of their core nature. Our true human nature is love, compassion and generosity. Fear and the belief in lack is the source of pain and suffering. Money is not the problem; fear in its many disguises is the problem. The answer is love. We were meant to grow trees of life and feed the world with the fruits of our labors. Every one of us is meant to prosper. We were meant to have a loving relationship with money. We were meant to use money as a gift that helps us prosper in our own lives, as well as assist in the growth and prosperity of those around us. Money is the energy of exchange and gratitude for services rendered. When shared generously, lovingly and gratefully, it changes everything it touches. Categories: Inspiration, Religion, Self-Worth, Spirituality | Tags: evil, fruitful and multiply, generosity, gold, greed, live long and prosper, love, money, money tree, prosper, prosperity, resource, the love of money, tool, transformation, tree of life | Permalink.